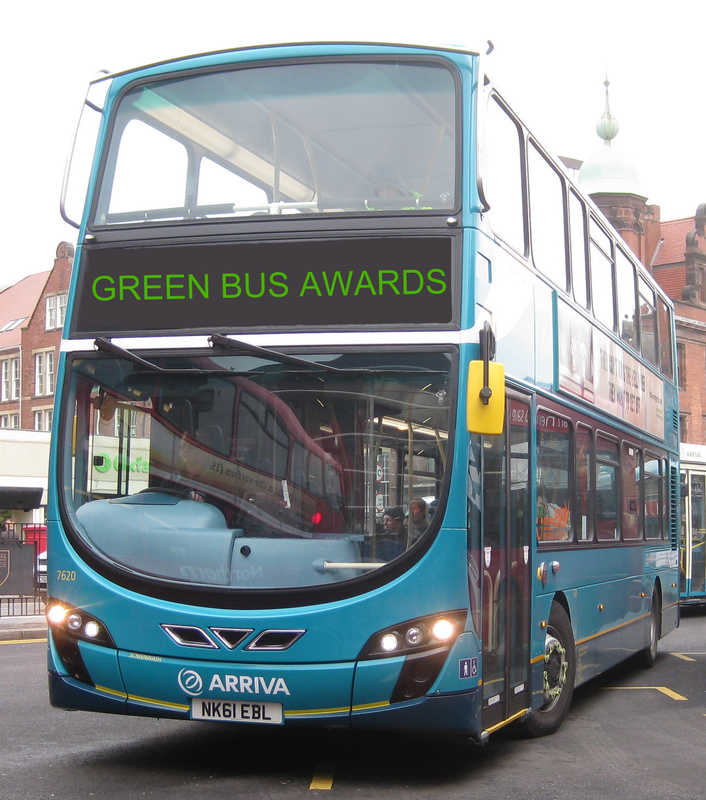 Following the recent Green Bus Awards, details of the Arriva orders have been published on their website. £26.7m will be invested in new, low carbon emission buses for the UK fleet. Arriva is funding £22.2m of the investment with the remainder secured through the government's Green Bus Fund. The orders are for 77 hybrid electric double deck vehicles and 21 carbon-neutral biogas-fuelled single decks, which will be used in the North East, North West, Yorkshire and Kent. • Arriva Southern Counties. The 11 new Volvo hybrid buses will be used on service 71 from Arriva’s Maidstone Garage. This is a busy service (10 minute Monday-Friday daytime frequency) with growing traffic arising from major housing development along the route. The buses will form the basis for a Quality Partnership with Maidstone Borough Council and serve areas identified in the council’s Air Quality Action Plan as pollutant hotspots. This service would also form part of a proposed quality partnership with Kent County Council. • Arriva North West (Liverpool). 33 new Volvo hybrid buses will be used to convert the high frequency group of cross river services (407, 432, 433, 437, 464, 472 and night 23, 37) that operate between Liverpool and the Wirral via the Mersey Tunnel, from Birkenhead. Air quality is a major issue within the tunnels. The Liverpool side of the tunnel exits directly into the Liverpool City Centre Air Quality Management Area, where reducing bus emissions will play a part in improving air quality. The hybrid buses will support delivery of the Liverpool City Council Air Quality Action Plan, the emission reduction goals in the Merseyside Local Transport Plan, and the environmental priorities of the Merseyside Integrated Transport Authority and the Passenger Transport Executive. It is also proposed to use the 10 new MAN Ecocity single deck gas buses on Runcorn local services 1 and 2 (Runcorn East to Halton Lea Circulars) and 3A/3C (Halton Lea – Runcorn – Weston Point). These services make extensive use of the Runcorn Busway. These are intensive services providing essential links for employment, shopping and onward travel at Runcorn’s stations for people living in Runcorn Central, Castlefields, and Halton Lea. The proposals support Halton Borough Council’s Carbon Management Programme, and will assist with delivering the recommendations of the detailed Health Impact Assessment that was produced as part of the local authority’s Local Transport Plan. • Arriva North West (Manchester). 11 new Volvo hybrid double deck buses will be used on the busy service 10, which operates a frequent (12 minute) service between Manchester and Salford. Virtually all of this route operates within areas which currently have relatively low air quality, and are situated in the designated Manchester and Salford Air Quality Management Areas. The service provides essential links from deprived areas in Salford such as Brookhouse and Lower Broughton to local centres at Eccles and Pendleton; to Manchester City Centre; and to Salford Royal Hospital. It also serves the area around Salford Shopping City, which is due for major regeneration. The proposal was supported by Transport for Greater Manchester, and is consistent with the aims of the Association of Greater Manchester Authorities’ Local Transport Plan, to utilise emerging low-emissions technology. • Arriva North East. 10 new Volvo hybrid double deck buses will operate on service 308 which is a busy trunk service operating through Blyth town centre and a designated Air Quality Management Area by Northumberland Country Council with transport emissions a key target for improvement. The route also operates into the Newcastle City Council Air Quality Management Area which includes key access routes as well as the city centre. The Green Bus Fund application was supported by Tyne & Wear Passenger Transport Executive Nexus and Northumberland County Council. In Darlington, Arriva will introduce 11 new MAN Ecocity gas buses on the busy local services 2, 11 and 12. These buses would operate using 100 per cent biomethane and would contribute to achieving the emissions reduction aims of Darlington’s Strategic Environmental Assessment and Local Transport Plan. • Arriva Yorkshire. 12 new Volvo hybrid double deck buses will be introduced to services 163 and 166, which link Castleford with Leeds via Kippax, Garforth and Cross Gates. These are busy trunk services, every 15 minutes Mondays to Saturdays (30 minutes on Sundays) from Arriva’s Castleford Garage. The services operate through designated Air Quality Management Areas at Castleford and Leeds, and the proposals support the ambition of the West Yorkshire Local Transport Plan to encourage cleaner technologies. • An additional Green Bus Fund award to Milton Keynes Council will support the provision of eight electric buses which will be operated by Arriva on its Bletchley – Milton Keynes – Wolverton service 7. The Arriva press release says that this investment represents the UK’s largest orders both for Volvo hybrid buses and for MAN EcoCity gas buses.